Original photo by Craig Robinson / Toronto Sun. To end the week, three stories about Rob Ford. December 15: In the midst of major budget meetings, Rob Ford finds himself standing in a backyard in Councillor Frank Di Giorgio’s ward, looking at a pile of sand. After examining the sand — a neighbour had complained about the pile — the mayor decrees that the sand must be moved. Rob Ford is the CEO of a corporation with $10 billion in annual revenues and a workforce of 50,000 employees. He runs the sixth biggest government in Canada. His decision to involve himself in a civil dispute over a pile of sand goes beyond micromanagement. It’d be like if Apple CEO Tim Cook volunteered to take a look at your broken MacBook. Yeah, hard to stop. The mayor comes out on the losing end of the city budget debate, but the sand is moved from the backyard a month later. January 26: With local councillor Frances Nunziata, a handful of staff and — always — a crew from the Toronto Sun, Rob Ford visits a TCHC building in Mount Dennis. This is the kind of thing he’s best at. Never is the mayor more likeable than when he’s visiting with people, listening to their concerns and promising action. While admirable, the mayor’s passion for this kind of politicking and governance — one-to-one, personal, on-demand — hints at one of his big weaknesses. As the mayor of the city, Ford can effect more large-scale change sitting at a board room table with staff than he can wandering the halls of a TCHC building, pointing out needed repairs. 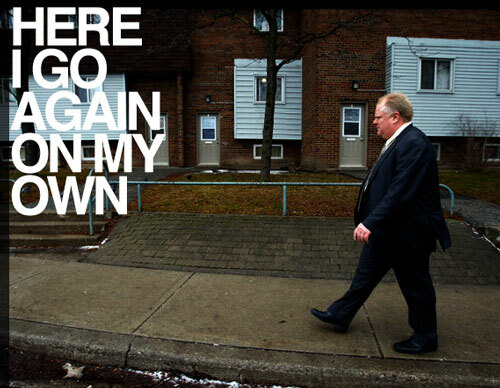 Even Rob Ford doesn’t have the energy to personally monitor the condition of every TCHC property in the city. If he really wants to improve conditions, he has to start with policy. With funding. With leadership. February 8: A few hours after losing a major vote on transit at a council meeting he didn’t even want to hold, Rob Ford decides to get on the subway. He begins riding at Royal York station in Etobicoke, going east toward the Scarborough RT and then on to Scarborough Town Centre. There are a lot of different things a mayor might be expected to do after losing a major vote. Riding trains and buses for four hours in the middle of night wouldn’t generally make the list. But Rob Ford isn’t conventional. The Sun’s Joe Warmington, invited along for the ride, tracked the mayor’s conversations with riders. The idea, I guess, was to collect feedback in favour of Ford’s subway plans. “This is where it’s all about it. I don’t call it retail politics. I call it the ground game. This is where the people are,” the mayor says, according to Warmington. In addition to talking transit, the mayor also talks to riders about other topics. His weight loss comes up. So does the old stand-by: city hall expense accounts. “I think it’s ridiculous all of the money that we have available to us at city hall,” the mayor says, maybe forgetting for a second that he’s no longer the perpetual outsider, no longer a rogue councillor from Etobicoke. He’s the mayor. Somewhere along the route, Warmington reports, a rider asks the mayor if he has a lighter. The mayor doesn’t, so he gives the woman five dollars. On the way back — it’s well past midnight — the mayor’s trip gets interrupted as the subway closes for the night. Rob Ford has missed the last train. He soon finds himself on the bus, but at Eglinton he and his staff realize they forgot to get transfers. The ride is over. The mayor takes a cab home. Again on his own. This entry was posted on Friday, February 10th, 2012 at 12:33 pm	and is filed under feature. You can follow any comments to this entry through the RSS 2.0 feed. Both comments and pings are currently closed.